Dr. John Shinsky is an educator, consultant, former athlete, and humanitarian. He currently serves as a Full Professor of Educational Leadership and Department Chairperson in the College of Education at Grand Valley State University. John joined the GVSU faculty in 2001 after having a successful 27 year career with the Lansing Public Schools as a classroom teacher, building administrator, Director of Special Education, and Area Director responsible for 14 schools on the Southside of Lansing. Dr. Shinsky received all three of his degrees from Michigan State University, a Bachelor’s Degree in General and Special Education in 1974, Master’s Degree in Special Education in 1977 working with students with emotional disorders, and a Doctor of Philosophy Degree in Educational Administration in 1983. John was Co-Captain of the 1973 MSU Football team, selected as a 1st Team Academic All-American Football player and was given the President’s Award for leadership, academics, and athletic performance at Michigan State University. Dr. Shinsky has served as a member and officer of numerous local, state, and national boards which include Boy Scouts of America, Phi Delta Kappa, Middle Cities Association, the Michigan Association of Administrators of Special Education, Council for Exceptional Children, Michigan United Cerebral Palsy, Michigan Protection and Advocacy, the Center for Independent Living, the American Society for Training and Development, and the Michigan Association of Professors aof Educational Administration. Overall, John has been a member of the Greater Lansing community since 1974 and has served his community in numerous capacities and has been duly recognized with many awards. In 2013, Dr. Shinsky received Grand Valley State University’s most prestigious Glen A. Niemeyer Academic Award for excellence, enthusiasm, and loyalty to teaching, scholarship, and service. In addition, John was selected to serve as the Michigan State University Legends representative for the Big 10 Conference. As a former orphan, Dr. Shinsky refers to his placement at Parmadale Orphanage as the foundation from which the most significant project of his life has evolved. John and his wife Cindy have built and currently serve as the co-founders and leaders for the City of Children Shinsky Orphanage in Matamoros, Mexico. John highlights his orphanage work as a means of giving back to those in need, based on the blessings and support he has received as a former orphan. While John has achieved many of his goals in life, his true passion continues to unfold as he strives to touch the lives of abandoned children, so that they can benefit from the same blessings that John has. 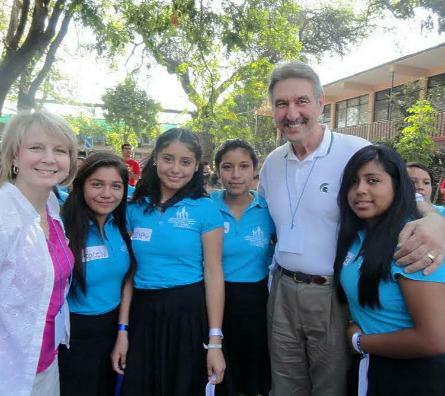 It is John & Cindy’s dream that one day in the near future, children from their orphanage will attend Michigan State University and become part of our great community.